"The Thoreau of the American West"
"It's a fools life, a rogue's life, and a good life if you keep laughing all the way to the grave." 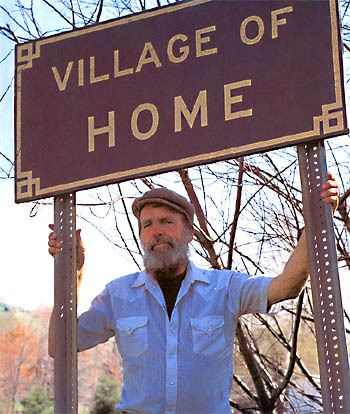 On January 29, 1927, Edward Abbey was born in Indiana, Pennsylvania nearby the village of Home. He was the oldest child of Paul and Mildred Abbey. He attended Indiana University of Pennsylvania after a brief stint in the military before heading to the West. Because of his love for the desert Southwest, Abbey atteneded the University of New Mexico. He earned both graduate and post-graduate degrees. Edward Abbey intended to enter into a graduate program at Yale but dropped out after a couple weeks. Abbey worked as a ranger and fire lookout at many different national parks for fifteen years; he was well into his forties at this time. The two seasons he worked at Arches National Monument in Utah inspired Desert Solitaire. Abbey married five times and divorced four. He died on March 14, 1989 at the age of 62 at his home after complications from surgery leaving behind his wife, five children, his father, and a legacy of more than a dozen books. Edward Abbey was buried in the desert as he requested. An echo of this is in Desert Solitaire, the story of a tourist who wandered off and died under a tree near Grandview Point in the Arches.